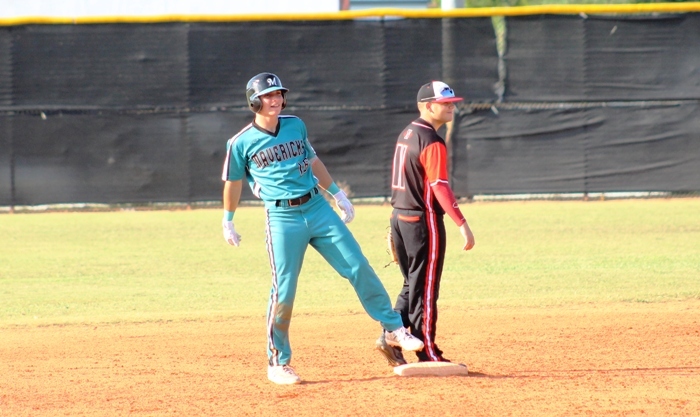 Archbishop McCarthy and Coral Springs Charter have suffered different fates so far in the 2019 season. While the Mavericks have struggled coming out of the gate, the Panthers have been one of the surprise teams in Broward eearly on. On Tuesday, their season starts will be irrelevant as the teams face off in bracket play that could lead to one of them playing in the title game of the HSBN March Madness tournament. On Monday, both Charter and McCarthy took care of business. The Panthers defeated South Plantation 6-3, moving to 2-0 in bracket play. The Mavericks won a wild affair, 11-9 over host Northeast, also improving their tourney record to 2-0. The problem both teams face is their runs against, which is the tiebreaker to determine which teams advance to the championship game. So far, Charter has given up 11 runs, and McCarthy 10. There are five Miami teams with less than five runs given up, so if either team wants to reach the title game it will take some help. On Monday, the runs didn’t matter. The Panthers did what they have done all season so far en route to their perfect 8-0 start, they had brought the lumber. In the third inning, Matt Magrann turned a scoreless game into a 2-0 Panthers lead with a two-run homer to left. South Plantation fought back, and tied the game in the fifth, but in the bottom half of the inning Charter showed their muscle again. Nick Giglio had a two-run single, and a balk brought in Matt Vargas. From there, Charter closed out the 6-3 win. McCarthy had much more a roller coaster afternoon. The mavericks jumped to a 6-2 fifth inning lead, behind some timely hitting and some shoddy defense from Northeast. In the bottom of the fifth, the Hurricanes fought back, scoring two runs and cutting the Mavericks lead to 6-4. McCarthy immediately answered with five runs, which was followed by five runs in the bottom half of the inning by Northeast. After putting the tying runs on base in the seventh, Jonathan Rodriguez was able to get Ryne Guida to fly out on a 3-0 pitch to end the game. Buzz Vorachek, Nick Modica, and Jake Alfara all had two hits for the Mavericks, and Lucas Sierra added three hits of his own in the 12-hit attack from McCarthy. Nick Steinberg had three hits for the Hurricanes, who had 12 hits of their own.